The Heavy Duty Clay Bar is for cars that have never been clayed. 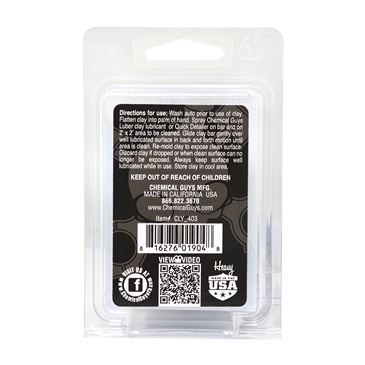 The Heavy Clay Bar is for extremely rough and sticky paint finishes full of heavy industrial contamination, pollution, tree sap, and brake dust. 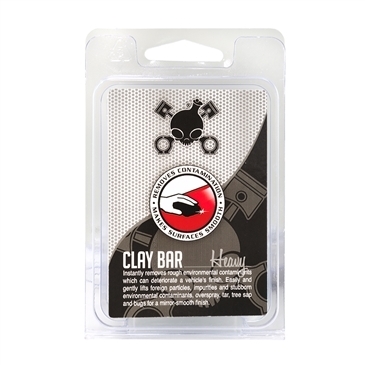 Only use the Heavy Duty Clay Bar when no other clay bar makes the surface feel smooth as glass. If you need to use the Heavy Duty Clay Bar, chances are the surface has been neglected and needs to be polished to remove swirls, scratches, and wash marring that accompany years of daily driving and parking out in extremely polluted conditions. First wash the car, decontaminate it with the Black Heavy Duty Clay Bar, then polish to remove swirls & scratches before sealing the paintwork with synthetic sealant or natural carnauba wax. For the worst of the worst, bust out the big guns and take down the heaviest brake dust and contamination with the Heavy Duty Clay Bar and Clay Luber combo. No Other Clay Bars Cutting It? Bust Out The Heavy Duty Clay Bar! If no other clay bar can make the surface smooth, bust out the Heavy Duty Clay Bar. Trust the Heavy Duty Clay Bar for the fastest clay bar service on severely-contaminated paint surfaces. The extra-sticky black clay bar grabs a hold of intense contamination that is stuck all over the exterior of your vehicle. Remove intense tree sap, brake dust, rail dust, paint overspray, pollution, and industrial fallout from any daily driver. If your car is more than 5 years old and you’ve never used a clay bar before, you probably have to use the Heavy Duty Clay Bar. Decontaminate any exterior surface that is shiny or clear with the Heavy Clay Bar. Rub the heavy clay bar with Luber synthetic clay bar lubricant over paintwork, glass, clear plastics on headlights and tail lights, and polished metals to make them feel smooth as glass again. Once they feel smooth to the touch, the surface is ready to be polished to remove swirls and scratches, and waxed to seal in a bright glossy shine. 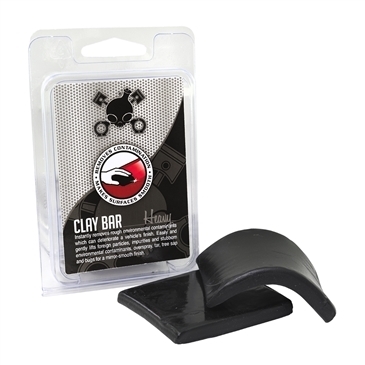 Use the Black Heavy Duty Clay bar for heavy stuck-on contamination that’s ruining your car’s shine. It’s time to use the clay bar when your paint does not feel smooth as glass. Any rough feeling is pollution and contamination stuck on the paint, and only the clay bar can remove it safely. Start by washing the vehicle: scrubbing loose dirt on the paintwork turns your clay bar into sandpaper, so avoid tons of swirls and scratches by starting with a clean surface. Use the proper lubricant to glide the clay by smoothly over the surface, and to maintain the integrity of the synthetic clay material. Attempting to clay with soap and water can be too rough on the paint and dissolve the clay bar, so stick to synthetic detail sprays and clay bar lubricants like Clay Luber for the best results. Break off just ⅓ of the clay bar and shape it into a small patty. Use only a small piece because if you drop the clay bar on the ground, you have to throw it away! Once it falls on the ground, the clay bar picks up any small rocks or bits of abrasive dirt and grit, and it is now sandpaper for your paint. Mist a liberal coating of your preferred lubricant over the surface, and gently glide the clay bar to pick up embedded debris. Quickly scrub in short 12” passes to fully decontaminate the surface. The clay bar will stick at first, but the rough sounds and stickiness will subside into smooth action as the surface cleans up. Work one panel at a time, and wipe off lubricant residue and buff the panel dry to avoid spotting as you work. Re-knead the clay bar to expose a fresh surface after working 1-2 panels, or whenever the surface looks too dirty to use. Discard the used clay bar once no fresh surface is exposed with kneading. Use the clay bar on any exterior car part that is shiny or clear, including paintwork, glass, clear plastic, polished metals, carbon fiber, and more. Follow the clay bar service with machine polishing to remove any swirl and scratches, then seal the pores of the freshly-cleaned surface with a coat of sealant or wax for durable protection and enhanced shine.